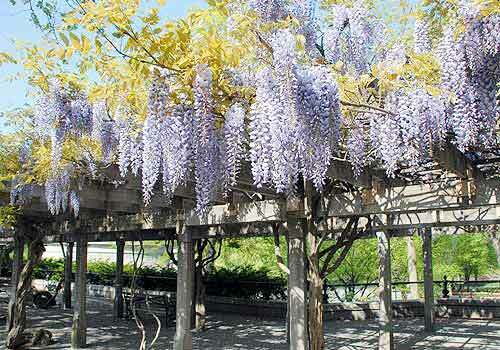 The Wisteria Pergola features century-old wisteria vines attached to a wooden shelter that is reminiscent of the original that was designed by Calvert Vaux. It was created as a cool refuge from summer sun, and as an overlook to the music concerts below at the original Bandstand. The Naumburg Bandshell was built in 1923 to replace the earlier cast iron bandstand, and the pergola became an unsightly and forgotten area. It was restored by the Conservancy in 1986. Mid-Park on The Mall at 70th Street near the Naumburg Bandshell.